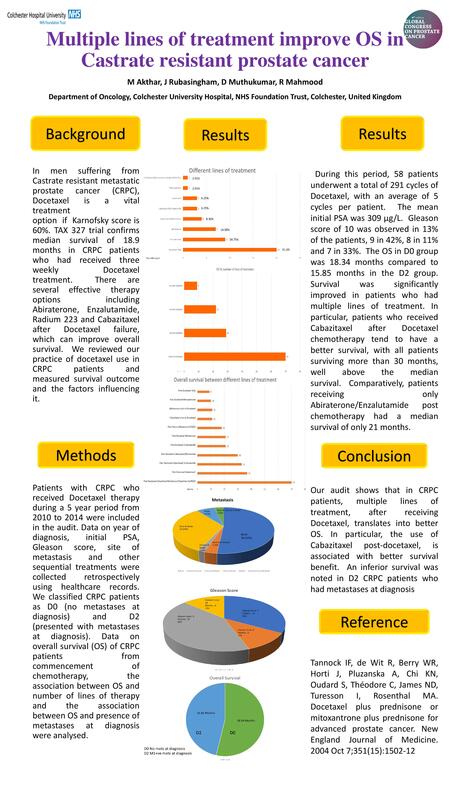 BACKGROUND In men suffering from Castrate resistant metastatic prostate cancer (CRPC), Docetaxel is a vital treatment option if Karnofsky score is 60%. TAX 327 trial confirms median survival of 18.9 months in CRPC patients who had received three weekly Docetaxel treatment. 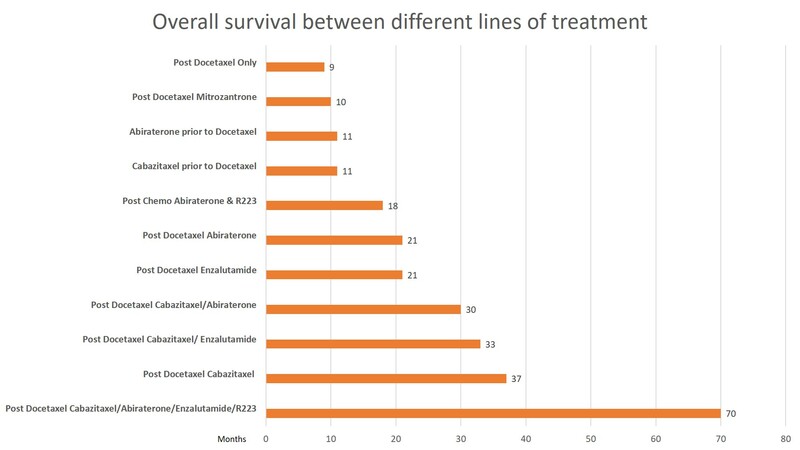 There are several effective therapy options including Abiraterone, Enzalutamide, Radium 223 and Cabazitaxel after Docetaxel failure, which can improve overall survival. We reviewed our practice of docetaxel use in CRPC patients and measured survival outcome and the factors influencing it. METHODS Patients with CRPC who received Docetaxel therapy during a 5 year period from 2010 to 2014 were included in the audit. Data on year of diagnosis, initial PSA, Gleason score, site of metastasis and other sequential treatments were collected retrospectively using healthcare records. We classified CRPC patients as D0 (no metastases at diagnosis) and D2 (presented with metastases at diagnosis). Data on overall survival (OS) of CRPC patients from commencement of chemotherapy, the association between OS and number of lines of therapy and the association between OS and presence of metastases at diagnosis were analysed. CONCLUSION Our audit shows that in CRPC patients, multiple lines of treatment, after receiving Docetaxel , translates into better OS. In particular, the use of Cabazitaxel post-docetaxel, is associated with better survival benefit. An inferior survival was noted in D2 CRPC patients who had metastases at diagnosis.